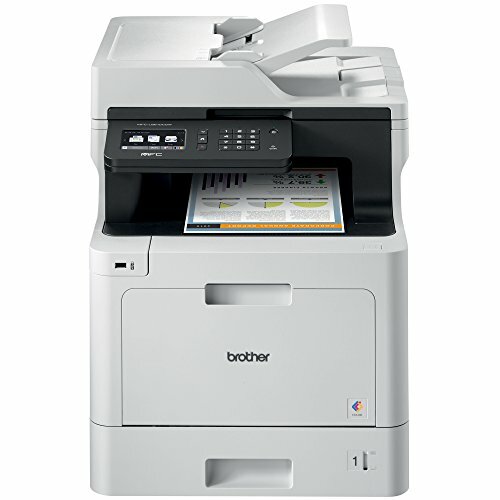 The Brother mfc-l8610cdw color laser all-in-one is ideal for offices and small workgroups. Delivers business quality, cost-efficient output with Brother genuine High-Yield replacement cartridges - 4,500 pages black, 4,000 pages color (approximate yields based on ISO/IEC 19798). print/copy up to 33ppm in color and black. 300-Sheet paper capacity, expandable to 1,050 sheets with optional trays. 50-Page capacity automatic document feeder scans up to 29ipm. Gigabit Ethernet/wireless networking. Print from/scan to mobile devices over a wireless network. 3.7" color touchscreen display with customizable shortcuts. Automatic duplex printing. Scan to a variety of destinations. Advanced security features for network user authentication Plus device access restriction.